Real Bride | Kelsey + Greg Engaged! It's hard to believe it's April! But with a new month, comes a new Real Bride. 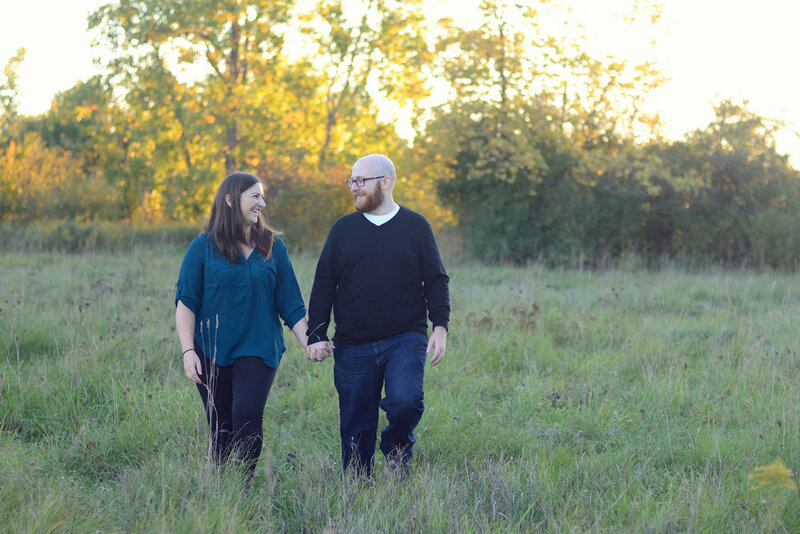 This month we'll be journeying with Kelsey + Greg who got married in February 2018. Today on the blog, they're sharing their engagement story. We met working together at Future Shop. Greg was in the department next to mine, right across the aisle. There was one night when I was at work after having a rough week that he sent me a picture of the sunset, something I always watch out our window. He said something along the lines of "I know you would be so excited if you saw this, I didn't want you to miss it." It was after he did that I knew I wanted to spend forever with him. He was taking me to Toronto after the Christmas holidays, as I had moved away for school. I knew something was up because he said there was something he HAD to do that morning. Turns out he was telling my parents his plan! We pulled off the highway in Milton and went for a hike to a frozen waterfall. He waited till we were alone and asked me to marry him. We were driving her back to school and we stopped at a conservation area. We hiked to a frozen waterfall and I proposed. Join us next week as Kelsey shares her Say Yes Story. She'll share the details of how she found her gown at Once Upon A Time Weddings. Photographs by Michelle A Photography. Don't have your gown yet? Book now to have OUTW help you write your Say Yes Story. Hello March! We love bringing in each new month with a new Once Upon A Time Weddings Real Bride! This month we are featuring Heather and her now husband Jamie Doerbecker. These two are seriously radiant for each other, we absolutely love their love story and hope you do as much as us! Just wait until you read Jamie's proposal below...swoon. "Orientation week at the University of Waterloo we were both leaders." "There wasn't a specific moment for me that I knew Jamie was the one, rather smaller ones added together. The smaller moments were always making me smile and making me laugh. He loves country music and so do I. He is very caring, thoughtful, and has a huge heart. He is always helping other people, putting others first which is similar to me. He always knows what to say in any situation. I have a big family and they are very important to me and when I saw him with them and feel comfortable around them and get along with my cousins I knew we would be together for a long time. I learned very quickly that Jamie's family is also important to him. Another thing that helped me see he was the one is when I see him playing with our little cousins and how natural that comes to him." Heather: "We were going to my parents house for the weekend. We were coming from Waterloo and heading just outside of Strathroy. I had asked Jamie if we could go watch the sunset before going to my parents house because it is one of my favourite things to do. I find it so relaxing and calming and wanted to be able to spend the quality time with Jamie. It was June 10, 2016 so it was starting to be nice weather. We decided to go out for dinner and went to the Growling Gator and sat on the patio. We were able to see the start of the sunset and the few clouds rolling in. We eat supper then walked down to the beach, we found a spot to sit and I asked Jamie to take a picture of me with the sunset and I also said I wanted pictures of us in front of the sunset as well. We went over and asked a group of girls if someone would come and take our picture. One girl agreed and she came over and took off her sunglasses and said, "Hi Heather, how are you?" I responded, "Hi Emily, I am good thanks and you?" We had a quick chat and Jamie said to me, "You know her!" which I said, "Yes we grew up down the street from each other and went to public and high school together". We got a few pictures together then Jamie said, "The sunset is beautiful tonight, but not as beautiful as you Heather." He then pulled out the ring, got down on one knee and asked me "Heather will you spend the rest of your life with me?" My reaction was, "OH MY GOD THIS IS HAPPENING RIGHT NOW?" Which Jamie said yes it is. After I let it sink it for a few seconds I said, "Of course I will!!" Jamie put the ring on my finger and we hugged and kissed. I got a bit teary and I was so excited!! I was so surprised when it happened. It was the perfect timing from Jamie, after he proposed the sunset was hiding behind the clouds. It was the perfect night! We were so happy we couldn't wait to tell our family and friends." Jamie: "A while before I actually proposed we were driving along the 401, I decided to bring up interesting ways to propose or how she dreamed of being proposed to. We had a lengthy conservation of good, bad and that better never happen if we were to ever get engaged. This conservation really didn't sway my idea on, Heather always loved watching the sunset so I knew that is how it had to happen. Once I had asked her parents for their blessing, I went out and got a ring from Poaggs. Since I was not from the area I asked Heather's parents to pick up the ring from the store once it was resized and had to figure out a time to get it from them. It just happened to work out that after they picked it up we all ended going to a jays game and I was able to get the ring from her dad and put it in the glove box while she was with her mom. I had it for a little while when Heather said she wanted to go see a sunset on the way to her parents, so naturally i agreed because little did she know she just planned her own engagement. For that night I packed a bag and was able to get to get the ring in without Heather noticing, there were a few close calls when she put some stuff in the bag and took some stuff out but she never noticed the ring box in the next pocket. As we were driving to grand bend we were just singing along to the radio when a friend of ours texted Heather so since Heather was driving she asked to text her back. This was really helpful to calm my nerves. We went for dinner downtown and then went to the beach to catch the sunset. We walked the beach for a little bit and then Heather said where would you like to go, I remember saying it really doesn't matter to me. Once we found a spot I got some towels out so we had something to sit on and Heather said could you take some pictures of me with the sunset so I did. She then said I would like some of us so I said I will go ask someone, and there just happened to be a group of girls sitting close by so I went to ask them. Heather said here take my phone cause it takes better pictures but I walked over to them and asked if they could take some pictures for us and they said sure. I handed them my phone with a note saying I am about to propose could you take some pictures for me. As she walked over to take our picture she said hi Heather, cause they had grown up down the street from each other. I had put my glasses in my backpack because they tint with the sun so they were pretty dark, which also allowed me to grab the ring and put it in my pocket. A few seconds went by then I looked at Heather and then the sunset and said the sunset is beautiful but not as beautiful as you, then I got down one one knee and said will you marry me? it took a few seconds for her to even say anything which were the longest seconds of my life. Finally she said is this for real and then said of course I will. Pretty much after she said yes we lost the sunset behind some clouds. As we were walking back to the car we started calling our parents and close friends." Join us next week as we explore Heather's journey to saying yes to the dress! If you're a Once Upon A Time Weddings Real Bride that wants to be featured one month, message us on Facebook or shoot us an email at info@onceuponatimeweddings.ca! If you've recently got some bling on your finger, we'd love to have you in the store to find your dream dress! Book your experience with us here. What I Wish Every Bride Knew… About Being Engaged. You’re engaged! Whether you’ve been waiting for a long time for that shiny ring of yours or your fiancé completely surprised you, you are about to embark on a new journey together. This is the first of a 5 part blog series that will help you navigate through some of the big decisions you will need to make now that you’ve gone from girlfriend to fiancé! In this first part we’ll tackle what to do first, how to announce your engagement in style, as well as cover three important decisions you should make ASAP. So grab a glass of bubbly and get ready to jump in! The Essential Thing You Must Do Now That You’re Engaged. The very first thing that you should do is call your insurance company and add your engagement ring to your policy. Because if heaven forbid something happens to your ring, I’m betting your fiancé doesn’t want to have to buy you a second one! Insurance can be purchased as an extension or sometimes called adding a rider, to your renter’s or home insurance. Call your insurance company today to get it added on. There are so many cute ways to announce that you’re engaged. Before you post it on social media make sure you have let all close friends & family members know personally. Send them a quick email, text or give them a quick call. Then post away on facebook, Instagram, twitter, etc. Be prepared for lots of questions regarding date, venue, etc! Throwing an engagement party is a good way to celebrate with family, friends and a great way to introduce members of the wedding party. Or it might even be a fun way to ask your guys & girls to be part of your wedding party. An engagement party can be as low key or as formal as you want it to be. The first important decision to make is where the wedding will be held at. This is crucial because it will determine your wedding date. Start researching wedding ceremony and venue locations right away. Draft a rough draft or your guest list so you have an approximate idea of number of guests before narrowing down your list of potential venues. Schedule a few tours and get some more information on your top choices. If you’re planning a backyard wedding or a wedding at the family farm, call a couple rental companies and ensure availability of a tent. The second important decision is to decide on your wedding party. Talk to your fiancé about how many people they are planning to ask to stand up with them. Then ask your wedding party to be part of your big day. Search pinterest for this as there are a ton of cute and fun ways to ask. The final decision you should do right away is research local wedding shows. Bridal shows are a great thing to attend when you’re first engaged as they are a great way to meet local wedding vendors, chat with other local brides and see some fun bridal fashions. For a list of bridal shows in Southwestern Ontario check out the Wedding Ring’s list http://www.theweddingring.ca/year.listevents/2011/03/23/. Browse through your local bridal shows and choose a couple to attend. I hope you enjoyed this article and got some good information on what you should do now that you are engaged. Next Friday I`ll tackle What I Wish Every Bride Knew About- Setting A Budget for the Wedding. If you have any questions, concerns or need to reach me you can email me at info@onceuponatimeweddings.ca, call me at 519.245.7997 or text me at 519.319.9441. Owner of Once Upon A Time Weddings.